← Ooops, we do it again! All in the interest of product testing it’s been bath time in Ashbourne for the last couple of weeks. 2-3 times a week Austin and I immerse ourselves in homemade bath melts, salts and milk powders (mind, not at the same time 😉 ). It’s not going to take long and we’ll develop gills and webs. Seriously. Putting it together: Grate the cocoa butter and melt over low heat with the shea butter. Once melted add the almond oil, the lavender buds and camomile tea (just cut the tea bag and stir contents in). Add about 5-6 drops of lavender essential oil to the mix last. Get your mould and add a drop of essential oil at the bottom of each form. Spoon mixture in and put into the fridge until solid. I usually leave it in over night. So this is the original recipe which sounds great, right? When I used it in the bath, however, I was less than impressed with the floating bits and pieces of lavender buds and camomile. Apart from the fact that the buds were sort of scratchy the oils are very heavy and all the floaty bits stick to you like they are glued on. I found myself twisting and turning in bed later like the princess on the pea trying to locate yet another piece of lavender that I had failed to remove previously. Hence, I re-melted all of the bath melts again and strained them through a sieve. Going forward there’ll be no scratchy and annoying solids in my bath melts. Also, I’ll slightly amend the recipe using less cocoa butter and up the amounts of shea butter and almond oil to make the melt a bit “lighter” on the skin. Bath melts go a long way in a bath tub so one (instead of two as used by me) will do for one full bath. We’ll pack the bath melts into our gift boxes that we’ll bring to the Trim Xmas market on December 8. What else is to be expected there? Bath milk sets! 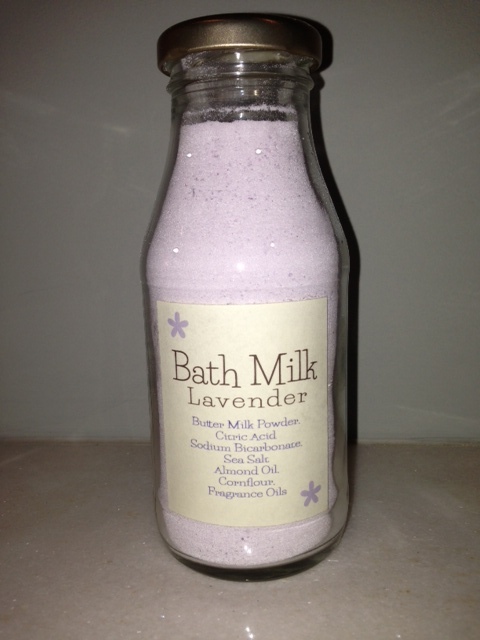 There will be lovely 3 pack (lavender, rose and jasmine) and 4 pack (almond, chocolate, vanilla and caramel) bath milk sets that will make you feel great and smell – to borrow from Jamie Oliver – delish! Sneak preview below. Posted on December 3, 2013 by soapmeprettyblog	• This entry was posted in Arts and Crafts, Baths and tagged Almond, bath melts, bath truffles, Cocoa butter, Shea butter. Bookmark the permalink.